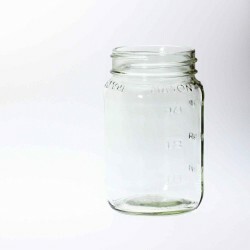 Box Of 48 Handle Jars / Beer / Moonshine Glass Mugs. These mugs are used as moonshine glasses and as beer glasses in bars and restaurants all over the USA and are making rapid inroads in Australia. Outside of their use as a drinking mug, they can also be used for arts and craft and gift giving. They suit Ball Mason regular mouth plastic lids so use them with a drinking straw lid or put on a daisy lid for a really attractive jar for candles or pot pourri. These jars are NOT compatible with Ball lids and bands so cannot be used for Cuppow or Ecojarz lids. 12oz max capacity measures W 70mm x H 125mm (10cm wide with handle). Ideal for serving beer, cider, or long drinks with lots of ice. Not suitable for home canning use. The mugs have a squarish shape and take regular mouth lids. Plastic caps are available separately. 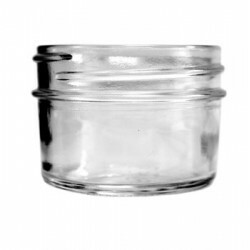 The photo shows the optional silver daisy lid but the jars do not come with any lids. 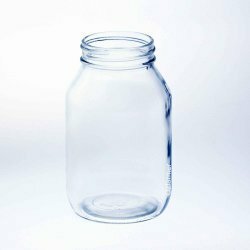 Note that in keeping with the rustic character of these jars the glass may have small bubbles and that they do not have any embossing on them.